JD here; with something I think you’ll find of interest. I was recently approached by a new player in the family friendly audio drama space and asked to take a listen to their first production. After listening to the drama I decided to share it with all of you. The following is my review of My Fair Lady produced by Northern Lights Radio Theater. After reading this review be sure to listen to the drama as Northern Lights Radio Theater is offering it to the public to stream for free! My Fair Lady is a short form dramatization of the hit Broadway musical from 1956. It was adapted for radio by Daniel Wanschura and Meagan Wanschura. The drama was directed and produced by Daniel Wanschura for Northern Lights Media. The entire production including introduction and credits is 15:38 minutes in length. Firstly, the format of the production is very similar to that of Focus on the Family Radio Theatre. It seemed that Wanschura used Radio Theatre as a reference point throughout the development of this project, which could be interpreted by some as a negative. I am somewhat ambivalent about this however, since I didn’t get the feeling that it was an outright, intentional mimicry. And more to the point, Radio Theatre is of the highest standard in quality so why not strive for the best? The overall project is very well produced. The score and sound design are of very high quality. I do not know if any “canned” sound effects were used in the production, but per the Northern Lights Media website, the team did spend quite a lot of time to record foley for this project. And I believe that the effort served them well. While the occasional use of a library effect is perfectly acceptable, I believe that when sound design is customized for each scene that it takes a production to another level of authenticity for the listener. Wanschura’s script omits many of the major plot points and presents a pared down version of the cast compared to previous productions of My Fair Lady, including one or two characters which seemed to be integral in other versions. However, the story moves along very quickly, and perhaps the omission of these characters and plot points was for time’s sake as it appears that this production was part of a college class project. I do wish that the script was a bit longer though; I like to see a production come in at the 30 minute mark at the least. Wanschura’s adaptation does seem very short compared to the almost 3 hour length of the film version. The dialogue could have been a little more developed in some places, but for the most part is nicely done. The actors’ performances are also done very well, with the exception of some very minor enunciation issues and a slight slipping of the British accent on occasion. That being said, I don’t want to give the impression that these petty issues are a huge detraction from the quality; they are not. My point is simply that the performances were not perfect. In conclusion, I was highly impressed with this production. Wanschura put much effort into this project and, in my opinion, it yielded a very favorable result. Daniel Wanschura and his team have every reason to be proud of this first effort. I would recommend this drama to all fans of quality audio drama. I am looking forward to future projects from Northern Lights Radio Theater. Perhaps a full dramatization of the complete storyline of My Fair Lady. Hint, hint. PLEASE NOTE: My review is based solely on my impressions of Northern Lights Radio Theater’s interpretation of the story not having seen either the stage or film versions of this story. The basis for any contrasts or comparisons drawn to either the stage or film productions is due only to preliminary research into these productions. 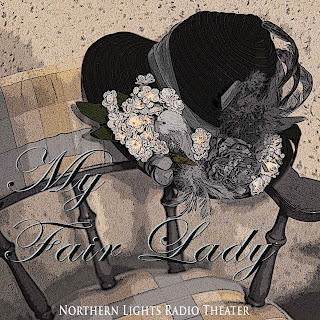 You can listen to Northern Lights Radio Theater’s production of My Fair Lady via the player below. Please leave your feedback in the comments. We’d love to hear your reactions and opinions. Also, if you really enjoyed the drama, then let Northern Lights Radio Theater know by posting a comment on their blog as well. The website features pictures of the cast and crew, recording sessions, and foley recording.